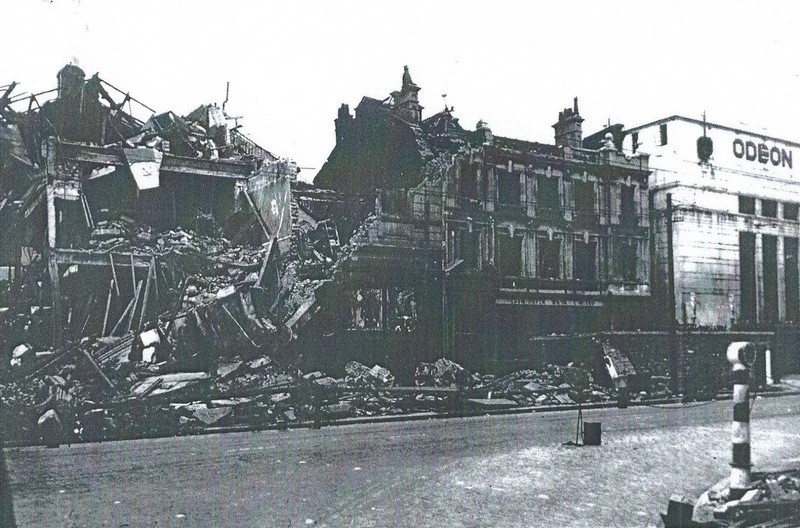 The most significant series of events of the last century to affect the constituent parts of Newham: East Ham and West Ham - including Forest Gate - were the World War 11 bombings. 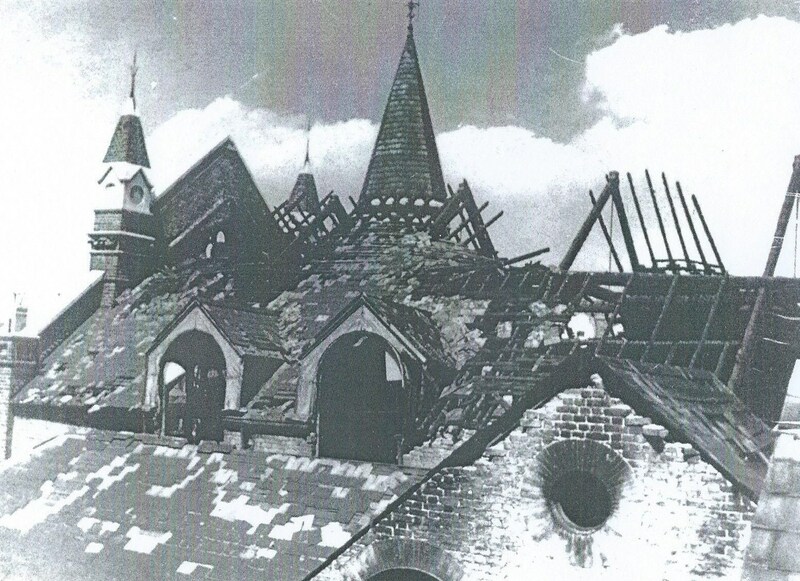 The whole physical structure of the borough was transformed by the destruction caused. Everyone today "knows" that the East End was badly hit, that local people were "plucky" and that sporadic visits to the sites of destruction by royalty litter the folklore of the area. No sane person can deny the extent of the destruction. Anyone with half an eye on architectural styles can spot areas hit by bombs, where late nineteenth buildings have been replaced by post-war structures - the lower east side of Woodgrange Road simply being the most obvious local example. 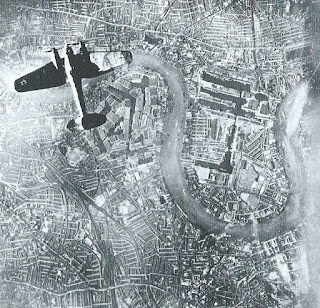 Whole swathes of the borough - particularly in the south, on the banks of the Thames - where the strategically crucial docks and other war-related industries were located - were flattened by German bombers, as they sought to disable the British war effort and demoralise the local population. But, relatively little reliable detail of the profound reconfiguration of our area actually survives. There is no definitive, hit-by-hit history of the bombing of London in general and Newham, in particular - just lots of fragments, that often don't correlate too well with each other. Hundreds of books have been published about London, the war and enemy bombings and some give very compelling eye witness accounts of specific incidents, such as Cyril Marne's of the Dames Road trolley bus doodlebug of 1944, recently covered on this site, here. But there is no overarching comprehensive account publicly available. A website www.bombsight.org was launched recently to much acclaim. 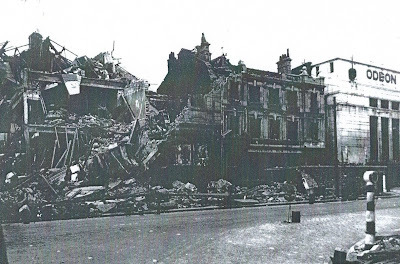 It locates all the main bomb hits of the Blitz (October 1940 - June 1941), and can be searched by post codes, offering very useful maps to site visitors. 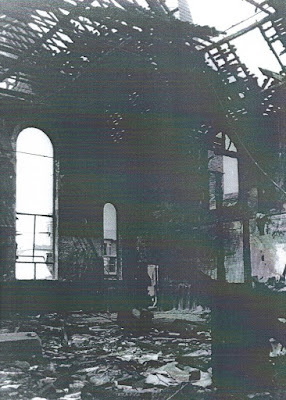 But it only covers a fragment of the war and offers no detail of casualties, the impact of individual hits, photos of the bomb sites, or eye witness accounts - certainly not of the Forest Gate area. Hopefully, these will follow, as the site is developed, over time. Some official records exist and are in the public domain. 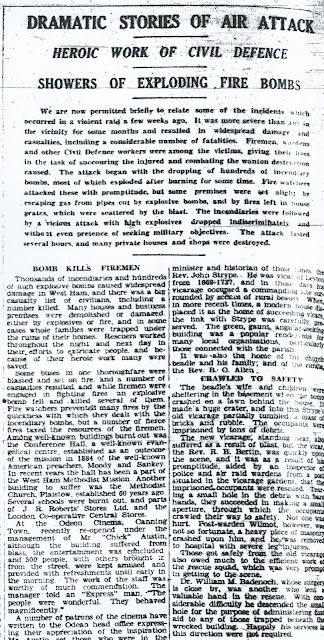 The former West Ham Council Civil Defence team published a summary of air raids on the borough, between 28 August 1940 and 8 May 1945. ARP (Air Raid Precaution - the civil defence organisation) records provide details of bomb hits, and they can be analysed by area. 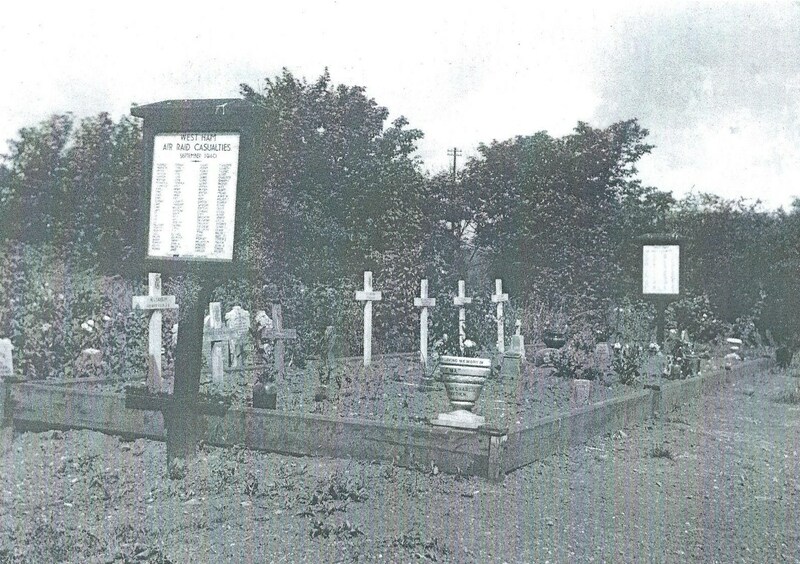 The War Graves Commission, in 1954, published a list of British civilian dead (including local people), West Ham Council produced its own roll of civilian remembrance from the war. Many of these records, however, are incomplete, and do not reconcile with each other. For example, the list of bomb hits obviously refers to the location of the dropped bomb, but the list of civilian dead is by the deceased's address, which is not necessarily where they were killed. It is not unreasonable to assume that when bombs fell in the early hours, in a particular road on a given day and people from that road were reported as having been killed on that day, that the deaths were as a result of the bomb in question. But other people, with addresses elsewhere may have been in the area when a missile struck, and could have been killed, but they would not have been recorded as a victim of that bomb. 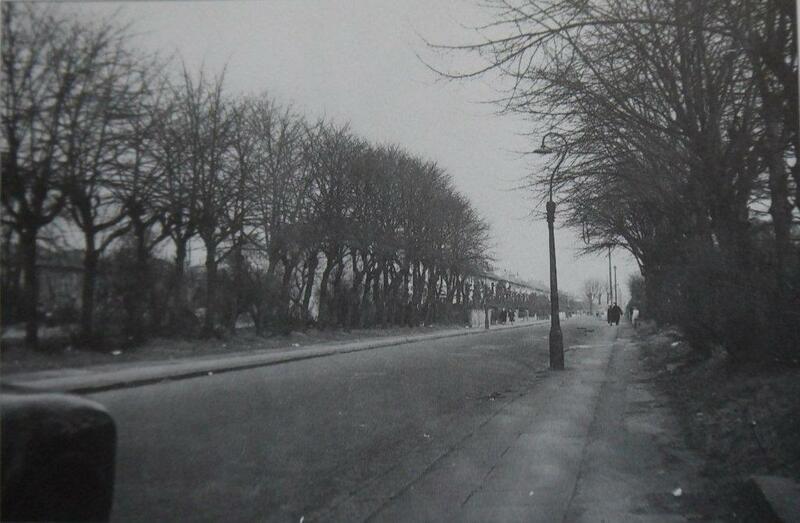 That was certainly the case of the Dames Road Doodlebug incident (see above). The eye witness account talks of several bodies being thrown about as the crowded trolley bus was blown up. By definition, most of those people were travelling and may not have lived in the immediate vicinity of the explosion. The civilian deaths would have been recorded by the home address and not the location of the explosion. Another dramatic example of this was probably the worst air raid to affect West Ham. It occurred on 10 October 1940. 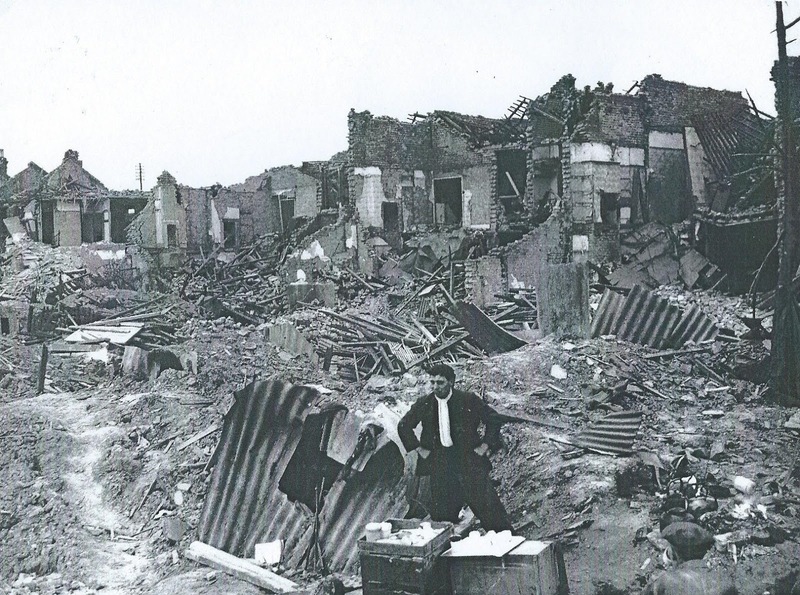 Several hundred people, bombed out of their homes, gathered in the South Hallsville school, Canning Town, waiting for evacuation. The transport did not arrive and the school received a direct hit from a high explosive bomb. The official council figure indicates that 73 people were killed and hundreds injured. To this day, survivors and their relatives are convinced that in fact many hundreds were actually killed, and the total number was hushed up, for fear of adversely affecting morale. it is difficult to tell, because of the circumstances, many of those killed did not live in the vicinity of the school, so their deaths would have been recorded at the locations of their homes. It is unlikely, however, that a true total list of fatalities and casualties will ever be established. This is the first of two articles on WW11 bombing in Forest Gate. It attempts to bring together the various records and supplement them with surviving photographs and some eye-witness accounts of specific incidents. It also reproduces some articles from the Stratford Express, which were heavily censored, extremely vague, and again, underestimated the numbers of deaths inflicted. It carries on in the non-informing way. This post deals with the first half of the war, up to the end of 1943; it is mainly focused on the Blitz (October 1940 - June 1941). Next week's installment covers the second half of the war - particularly the horrific V1 and V11 bombings. 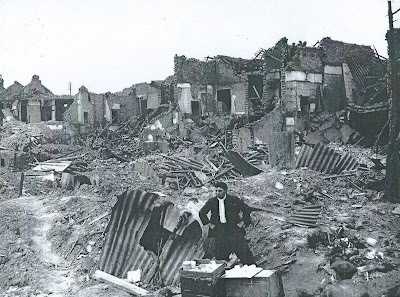 West Ham Civil Defence statistics claim that although the first air raid was on the opening day of the war 3 September 1939, the first bomb did not land in Newham until almost a year later 28 August 1940. 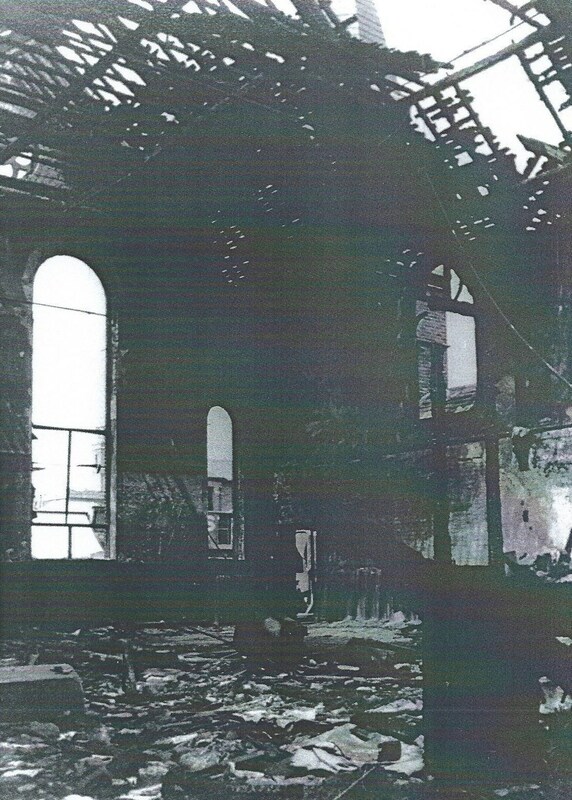 ARP figures, however, indicate that the first bomb hit Forest Gate six months earlier! Just the first and most obvious lack of reconciliation between different bombing records and accounts. 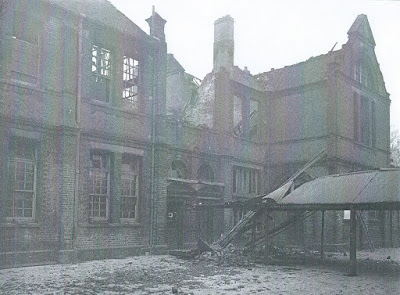 These, admittedly less than reliable, Civil Defence statistics, suggest that there were a total of 1,227 air raid alerts affecting the borough and 194 actual raids. Many of the raids, of course, resulted in multiple bombings. 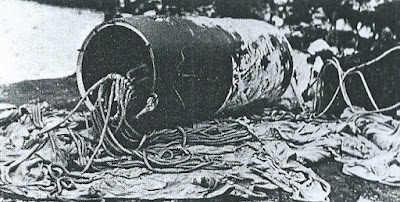 They estimated that there were 3,221 hits in the borough; about a third of which were high explosive bombs, a third incendiary bombs and the remainder a variety of other missile devices - some of which remained unexploded. Their figures suggest that 1,207 West Ham civilians were killed in these raids, with 2,545 received hospitalisation and 3,322 received treatment at a first aid post. This is almost certainly an underestimate. What follows is the ARP's listing of bomb incidents in Forest Gate, by date and location. In brackets and italics are the names of civilian fatalities identified by either the War Graves Commission or West Ham council's rolls of civilian dead most likely to have been the result of the bomb hit recorded. Public spaces, or buildings identified in the records are presented in bold italics. 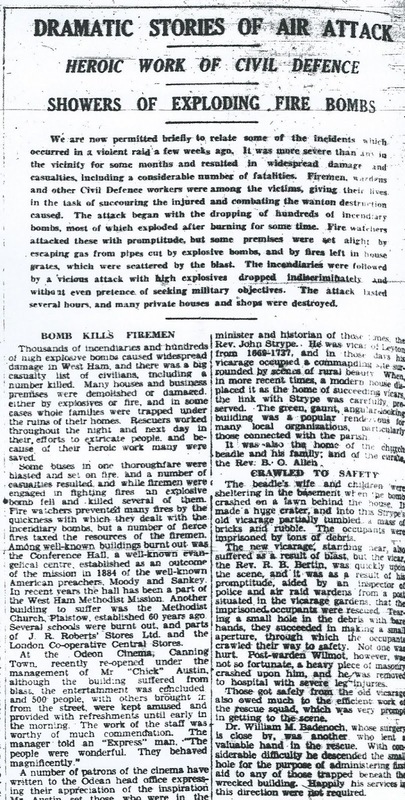 Using those figures, it can crudely be estimated that there were approximately 245 incendiary devices of different kinds dropped on Forest Gate during World War 11, and 124 Forest Gate civilians were killed during the war. But, for reasons explained above, we cannot deduce from this that 124 Forest Gate civilians were killed in the district during the war, or that only 124 people were killed in Forest Gate! Contemporaneous photographs, and some Stratford Express reports have been inserted following details of some of the most significant bomb hits. We are sure what follows is far from definitive, so would be delighted to receive any corrections or additional eye witness accounts from the surviving band of war time residents of the area - which we will happily append to this post, with full credit being given to the source (if they wish). Next week - Part 2 - 1944 - 1945.
the week after the hit. One of the great (and loudly sung) successes of Forest Gate over recent months lurks behind the boarded up decay that was once the proud Old Spotted Dog pub, on Upton Lane. Tucked to one side of the pub is the almost equally decrepit exterior of Clapton FC. We have written about the club's history (here), its most iconic player (here) and the on-going power struggle between the club's apparent "owner" and its supporters (here) before. There is much more to tell, however; hence this blog. 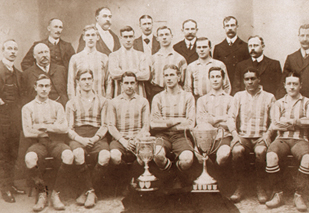 • Won the Isthmian - now Rymans - League (of which it was a member for 100 years) twice. 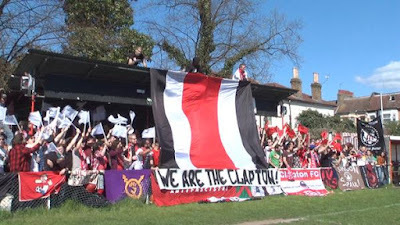 Now playing in the Essex Senior League (eight divisions below the English Premier League), Clapton's attendances have grown rapidly since 2012, from an average of 20 to over 500 at the end of the 2014/15 season. This article attempts to explain this remarkable turnaround in the club's fortune and provide an update on some of the more deep-seated problems it and its supporters face. The main stand, on the half way point. 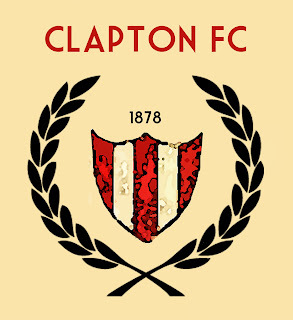 • After having not appeared in a cup final for thirty years, Clapton FC last season appeared in two (both of which were lost)! • The club finished in eighth spot in the Essex Senior League, its highest position in the last decade. Apparently this was only the third time since the 1930's that it has finished in the top half of the division it has played in! More and more football fans have started to attend because of the unique atmosphere created by the Clapton Ultras, the club's noisy and passionate supporters. They are part political and campaigning, and wholly football fans. This is an engaging combination of characteristics and makes a refreshing change to the same old tedium experienced in so many higher league (including the Premier) grounds. This, as their attendees will know, usually features boorish, "laddish", often intimidating, offensive right-wing and personally abusive chanting and threatening behaviour towards away supporters and players. Not to mention increasingly exorbitant entrance prices. club's strip - Up The Tons! 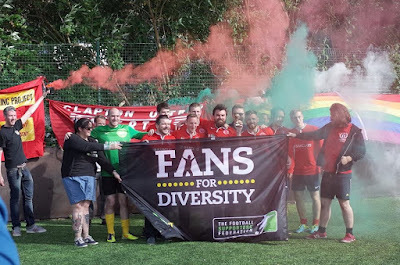 Strongly anti-fascist and anti-discrimination, the Ultras are trying to build a club that is affordable, welcoming and family friendly, but also one that completely rejects racism, homophobia and sexism - a different experience to a lot of modern football and a chance to watch a game in a space that is safe and inclusive. • organising regular food bank collections for the Refugee Migrant Project (RAMP), supporting asylum seeker and refugee families with no income. • clearing fly-tipping from the grounds of the Old Spotted Dog public house. • raised funds for Newham Action on Domestic Violence. • distributing information locally on people's immigration rights. • launching and supporting a successful appeal for funds for Paris - Newham's only LGBTQ (Lesbian, Gay, Bi-sexual, Trans-sexual, Queer) youth group. organised a Fans for Diversity football tournament in Mile End. If you love watching football, but think you have no alternative but to pay a huge amount of money for a ticket and then to have to put up with nasty, racist, sexist, homophobic "banter", go and experience a Clapton game. The Ultras promise you, you won't regret it! You'll even get to shake hands with the players - usually of both teams - after the game. Despite success on the pitch, controversy and in-fighting predominate behind the scenes. As we have reported before (here) there is a severe clash of ambition and desire between the club's apparent owners and its fan-base. This often happens in football, when there is a gap between the unrealistic expectations of fans and the capacity of owners to subside the route to achieving them. The story is very different in Clapton's case. At the centre of the concerns is the very valuable piece of real estate that the club occupies. 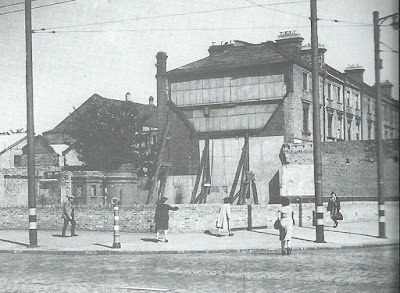 It is perhaps no co-incidence that the ground and its buildings have been allowed to decay at almost the same rate as the historic Old Spotted Dog pub next door. The pub is the oldest secular building in Newham, but is rotting away, boarded up. Planning permission will never be given for this local, and nationally listed, treasure to be destroyed, replaced or significantly altered. But, in its current state, it is unusable and it is difficult to see how it could again become a going concern, without a major source of external funding. It is, however, only one careless match away from destruction. The prospect that its land foot print, extensive car park and that of the Clapton FC ground would then have for housing redevelopment, in this increasingly desirable and expensive part of East London, would make a property developer salivate. A £5m profit would not seem excessive for those in control of the land. Enough of the speculation and fantasy. Back to the here and now. The freehold of the Clapton FC ground rests with a property company. 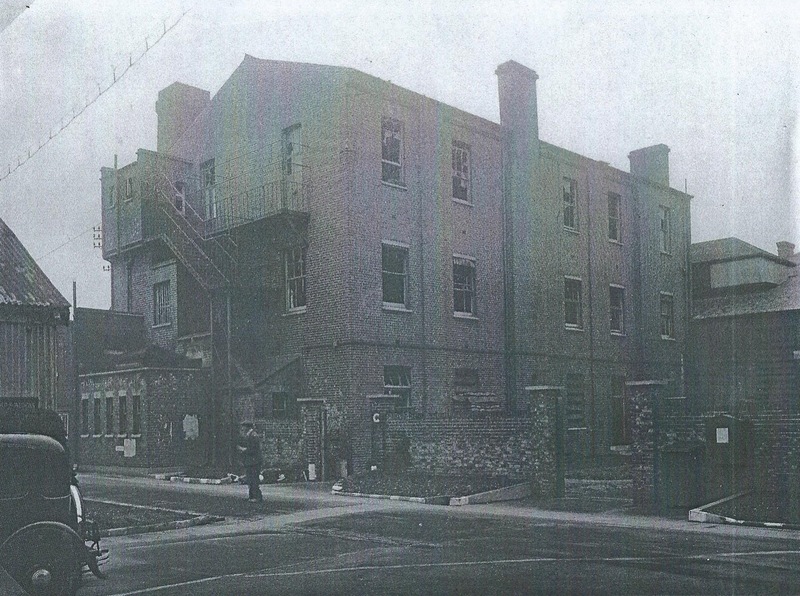 A 100-year lease on the ground was granted by them to the Clapton Trust Ltd in 1992. The Trust, however, remains a separate entity to the football club, and, in any case, has subsequently changed its name to Newham Community Leisure Trust Ltd. 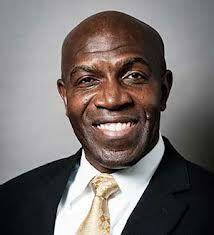 The public face of the Trust is its chairman, Vincent McBean, who lives in Lambeth. He has tried, unsuccessfully, to purchase the ground from the freeholders, in a personal capacity. A former trustee was Dwayne Brooks, friend of murdered Black teenager, Stephen Lawrence. 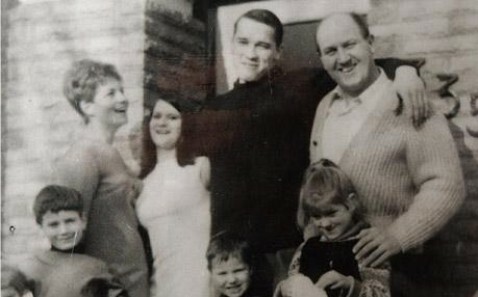 He and Stephen's mother, Doreen, have feuded for years. Brooks is currently a Liberal Democrat councillor in Lewisham, with no known connections to Newham. Another Lewisham resident, Rashford Angus, is also a trustee, as is Newham-living Esmond Syfox. 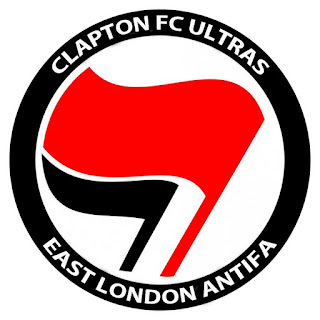 Quite why two Lewisham and one Lambeth residents should end up running the Newham Community Leisure Trust is not clear - particularly since they have resisted all attempts by a well-organised club supporters group to become involved with it. According to a recent Google search, the Trust is now more than nine months behind in fulfilling its obligation to file its accounts with the Charity Commission. This kind of non-compliance is not unusual for Mr McBean, who has a long history of failing to fulfil statutory obligations. He has had companies struck off for either not filing accounts or returns and being in receipt of warning letters about his financial conduct. See here, for the full details. Worryingly, for the fans of the club, if this negligent behaviour continues the Trust will be struck off by the Registrar of Companies and the charity by the Charity Commissioners, at which point the lease could revert to the freeholders. part of the Clapton experience! This was the situation in 2003, when Mr McBean failed to similarly comply with company regulations. It was not until 2008 having opened negotiations for a sale of the lease, that Mr McBean applied to the High Court to have the company re-instated. 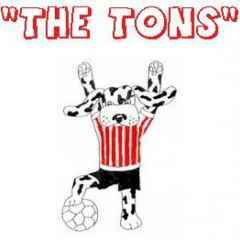 Even then, the charity was not re-instated until the Charity Commission were alerted by the supporters with regard to their concern over the club's security of tenure on the ground. Another bout of non-compliance with charity and company filing obligations by Mr McBean and chums could see both being formally wound up. Cue: end of club (or at least its 127 year association with the ground) as speculators squabble over the valuable real estate spoils. A well organised group of supporters is determined to prevent this undignified ending of the relationship between the club and its historic ground. They have tried, in vain, to engage and negotiate with Mr McBean. It is proving an uphill struggle. A combination of the old adage about possession being nine tenths of the law and football authorities showing the same disregard at a local level for the rights of spectators that the Premier league quite disgracefully do at a national level for their supporters, means that voices which are loud on the terraces are not being listened to by the relevant authorities. Legal action is afoot to preserve the heritage of this proud football club, and place its future in the hands of the one big consistent about football at all levels - the supporters. We would urge all those with an interest in grass roots football, local history and community action to engage with this important local campaign (see below for details and contacts). Ultras use to announce their presence. 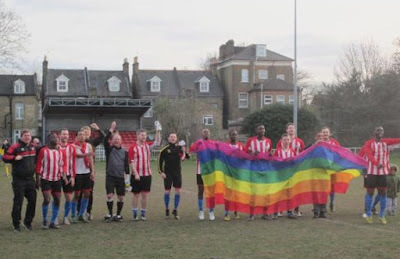 As the Ultras say: "Another kind of football is possible, and it's happening right now in Forest Gate." 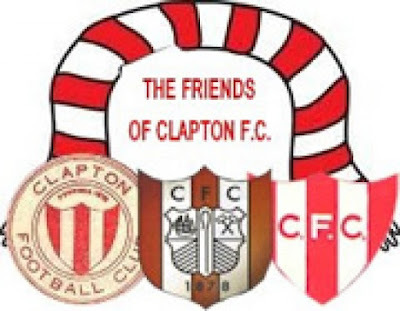 Go along, join in, be entertained, have fun, become a member of Friends of Clapton FC (details through links, above) and help save a great local institution! 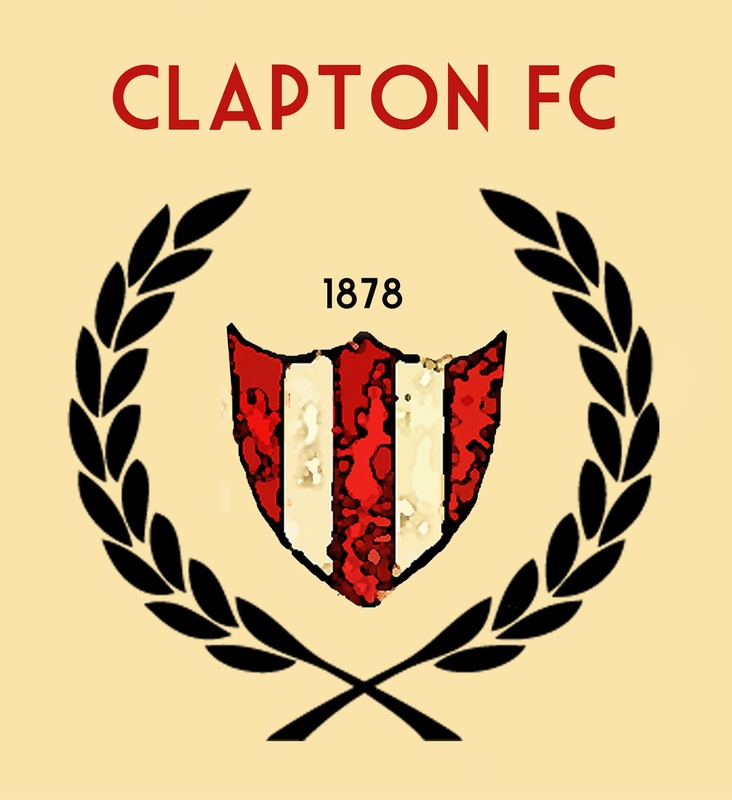 You will find details of Clapton's home fixtures for the remainder of the year in the Events panel, to the right of this article. Arnold Schwarzenegger is one of Forest Gate's most famous adopted sons. His stay in Forest Gate was the subject of this website's first-ever, and most visited, post, see here. 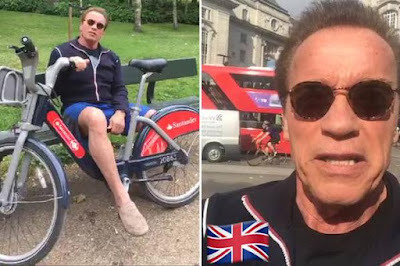 Arnie was in London recently, posing with one of the city's "Boris bikes" - see photo, below. So, we thought it would be timely to give his account of his days in Forest Gate - from his autobiography: Total Recall (see footnotes for details). Three months later, I was back in London, laughing and horsing around on a living room rug with a jumble of kids. 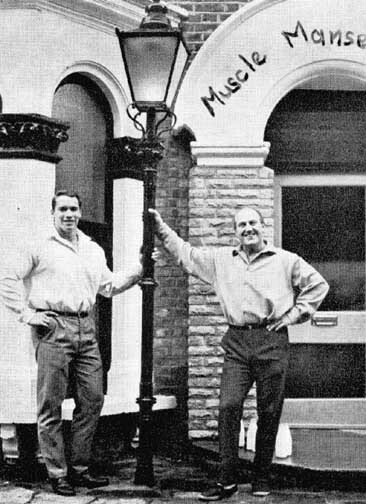 They belonged to Wag and Dianne Bennett, who owned two gyms and were at the centre of the UK bodybuilding scene. Wag had been a judge at the Mr Universe contest, and he'd invited me to stay with him and Dianne in the Forest Gate section of London (ed: in what is now the burned out house on Romford Road, opposite Emmanuel's church) for a few weeks of training. They had six kids of their own, they took me under their wing and became like parents to me. Wag had made it clear that he thought I needed a lot of work. At the top of the list was my posing routine. I knew there was a huge difference between hitting poses successfully and having a compelling routine. Poses are like snapshots, and the routine is the movie. To hypnotise and carry away an audience, you need the poses to flow. What do you do between one pose and the next? How do the hands move? How does the face look? I'd never had a chance to figure very much of this out. Wag showed me how to slow down and make it like ballet: a matter of posture, the straightness of the back, keeping the head up, not down. This I could understand but it was harder to swallow the idea of actually posing to music. Wag would put the dramatic theme from the movie Exodus on the hi-fi and cue me to start my routine. At first I couldn't think of anything more distracting or less hip. But after a while I started to see how I could choreograph my moves and ride the melody like a wave - quiet moments for a concentrated, beautiful three-quarter back pose, flowing into a side chest pose as the music rose and then wham!, a stunning most muscular pose at the crescendo. Dianne concentrated on filling me up with protein and improving my manners. Sometimes she must have thought I'd been raised by wolves. I didn't know the right way to handle a knife and fork or that you should help clear up after dinner. Dianne picked up where my parents Fredi Gerstl and Frau Matscher had left off. One of the few times she ever got mad at me was when she saw me shove my way through a crowd of fans after a competition. The thought in my head was 'I won. Now I'm going to party'. But Dianne grabbed me and said 'Arnold, you don't do that. These are people who came to see you. They spent their money and some of them travelled a long way. You can take a few minutes and give them your autograph.' That scolding changed my life. I'd never thought about the fans, only about my competitors. But from then on, I always made time for the fans. Even the kids got in on the Educating Arnold project. There's probably no better way to learn English than to joining a lively, happy London household where nobody understands German and where you sleep on the couch and have six little siblings. They treated me like a giant new puppy and loved teaching me words. 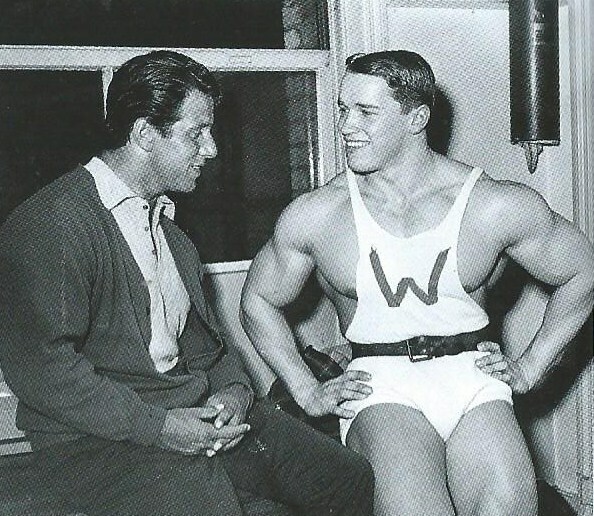 A photo of me during that trip (see below) shows me meeting my boyhood idol, Reg Park, for the first time. He's wearing sweats, looking relaxed and tanned, and I'm wearing my posing trunks looking star struck and pale. I was in the presence of Hercules, a three-time Mr Universe, of the star whose picture I kept on my wall, of the man on whom I'd modelled my life plan. I could hardly stammer out a word. All the English I'd learned flew right out of my head. Reg now lived in Johannesburg, where he owns a chain of gyms, but he came back to England on business several times a year. He was friends of the Bennetts and had generously agreed to help show me the ropes. Wag and Dianne felt that the best way for me to have a good shot at the Mr Universe title was to become better known in the United Kingdom. On my way through London, I called Dianne Bennett to say hello. 'Your mother has been trying to find you', she said, 'Call her. Your father is ill.' I called my mother and then went home quickly to Austria to stay with them. My father had suffered a stroke." His father died soon afterwards, when he was back in Los Angeles. The outline of Arnie's story from there is well-know: after the body-building came Hollywood stardom and a marriage into the Kennedy family then the governorship of California. You can read the detail in the autobiography. 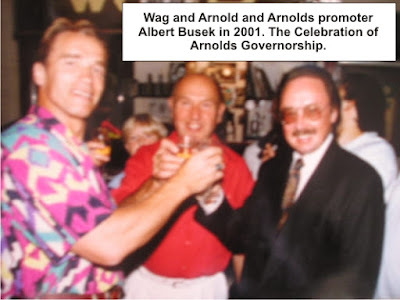 Forest Gate and the Bennetts do not get a further mention in Arnie's book, but the close contact between him and his Forest Gate mentors remained, as the photo of him and Wag, celebrating his election as Governor of California in 2001 illustrates (above). Footnote: Total Recall - my unbelievably true life story, by Arnold Schwarzenegger, with Peter Petre, published by Simon and Schuster, 2012. Available from all good bookshops and Amazon, pb £8.99. Thanks to all concerned for being able to publish the above - and make the story available to a wider, local audience.